The 100% electric Nissan LEAF will go on sale in Norway this autumn, making Norway the ninth market in Europe to launch the award-winning, zero-emission vehicle. At 255,000 NOK, the European and World Car of the Year will cost about the same as a regular compact family hatchback, but with considerably lower running costs. Running costs in Norway are estimated at less than 12 NOK per 100 km. The price includes the battery (which carries a five-year/100,000 km warranty), a five-year subscription to the unique telematic service, and EV specific roadside assistance. 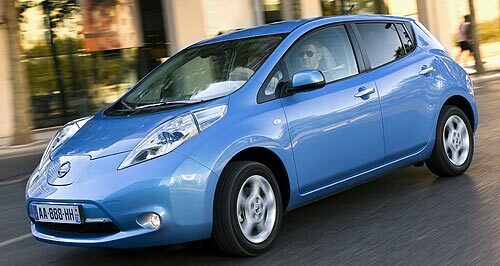 Nissan LEAF is exempt from non-recurring vehicle tax and VAT in Norway. The car is also exempt from public parking fees and toll payments. "We are confident Nissan LEAF with its family-sized practicality, zero emission tailpipe and ultra-low running costs will appeal to customers in Norway, just like it has appealed to thousands of other customers around the world," said Guillaume Cartier, Managing Director, Nissan Nordic Europe. Interested customers should head to the Nissan website - http://www.nissan.no/ - where they can find more details about the ground-breaking car. Nissan LEAF comes fully equipped with air conditioning, satellite navigation, rear-view parking camera, a quick charge socket and innovative smart-phone connectivity that will allow users to heat or cool the interior of the car remotely via a mobile phone allowing for better range management. Deliveries of Nissan LEAF - which has a range between charges of up to 175 km as tested over the New European Driving Cycle (NEDC) - have already begun in the UK, the Netherlands, the Republic of Ireland and Portugal. Order books have also opened in Switzerland, France, Spain and Belgium with customers in those markets expected to start receiving their cars shortly. The first deliveries in Norway are expected to start by the end of this year. Nissan LEAF recently received a top five-star safety rating from the European New Car Assessment Programme (Euro NCAP), making it one of the safest cars on the road in Europe.